STORY: Indian Prime Minister Narendra Modi on Sunday (February 03) said his government would leave no stones unturned to tackle militancy. He made the comments during his daylong visit to northern Jammu and Kashmir state. “We will break militancy in Kashmir, said Modi while speaking to students at Sher-i-Kashmir International Conference Centre in Srinagar. 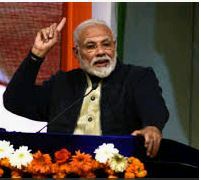 Earlier in the day, Modi inaugurated several development projects including two All India Institutes of Medical Sciences (AIIMS) in state capitals Jammu and Srinagar. He also addressed public meetings in Leh and Jammu. Modi also visited the iconic Dal lake in Srinagar after his interaction with the students.